what does this look like to you? it’s not the prettiest food ever, but does it look like fried rice? it’s cauliflower! but it tastes like fried brown rice ~ honest! i really love cauliflower, but of course, i love it swimming in some kind of creamy cheese sauce. not so healthy. i also have been missing rice, which is weird because i never really liked it before i went off grains and gluten. so here’s a way to satisfy your cravings and get a healthy and easy base to your meals! 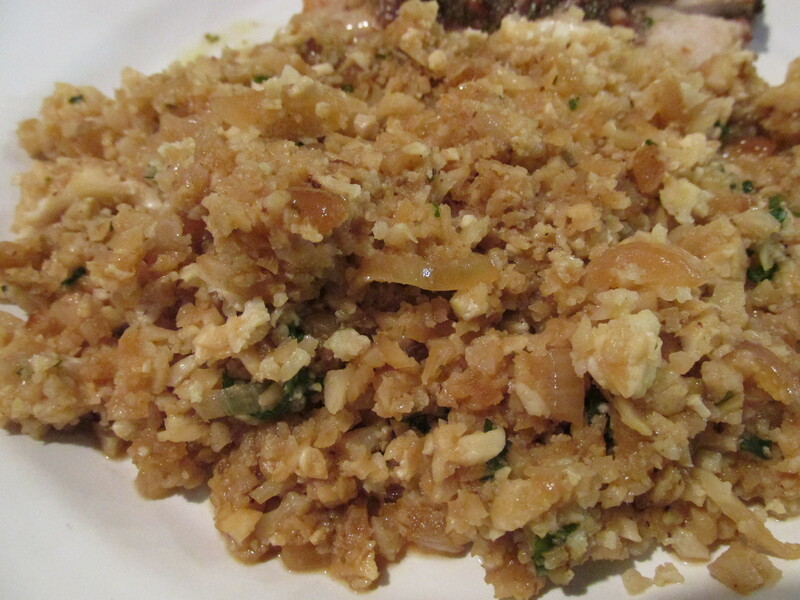 fried cauliflower “rice” in a frying pan, caramelize some yellow onion in olive oil until it starts to brown. add some minced garlic, soy sauce (tamari if you’re gluten-free like me), a dash of sesame oil, and some fresh grated ginger. meanwhile, in a food processor, add a head of cauliflower and pulse until it resembles rice ~ that easy! i think it’s best to put it in two batches, though. pulse a little, then add it to the frying pan. then pulse the rest and add it. stir it all together and fry for a few minutes. then add some chicken, veggie, or miso broth (about a 1/2 cup), and let it soak up all the yummy juice. add more soy sauce to taste, or just add a little salt if you need. toss in chopped cilantro! of course you can do anything you want with this basic recipe ~ add more veggies, add meat, whatever you want. it’s faster than rice and think of all the fantastic nutrients you’re getting from cauliflower!!! Previous Previous post: paleo “oatmeal” raisin cookies.